Welcome to this week's edition of the Frugal Friday Linky Party. Remember how I've been promising to share my own Frugal Friday post ? Well, this week I've finally done it. Today I'm talking about pretti-fying pillow cases. When I was redo-ing our master bedroom, I couldn't find exactly what I was looking for in the pillow case department. So I decided to create my own. Well, to be honest, all I did was embellish a pair of store bought cases. 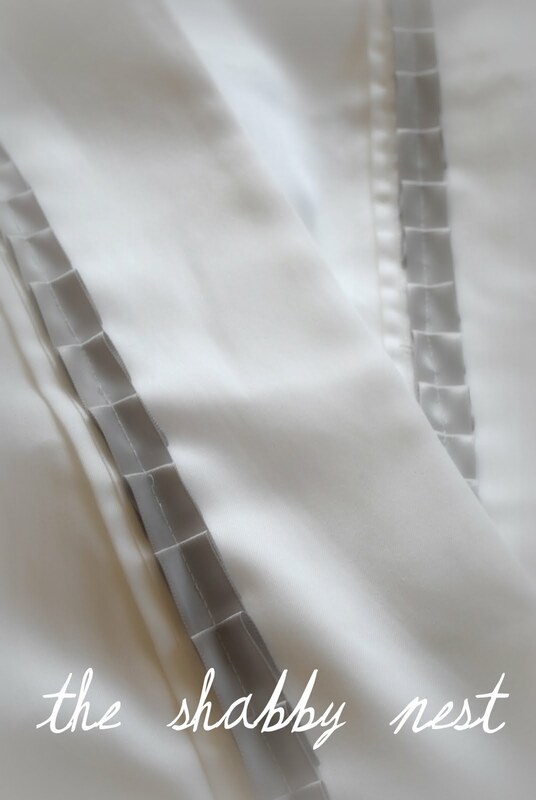 I purchased a pair of white wrinkle free pillow cases, and then all I did was sew on some ribbon. Easy peasy. What's that you say? You don't sew? No problem. Even someone who has never sewn can do this project. All it involves is one straight line of stitching. 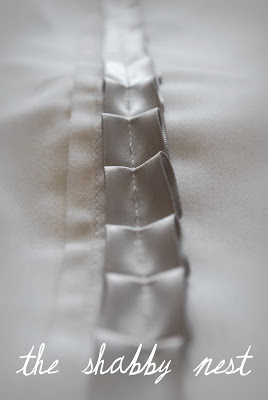 Pick out a ribbon of your choice, and then simply stitch it along the seam of the pillow case edge. In my case, I decided to add pleats to my ribbon. But I am not super picky when I do this kind of thing, so I didn't fold and pin...no I didn't. I just folded the ribbon as I sewed....eyeballing it for spacing. Truly, it was soooo easy, and it turned out beautifully. 2. 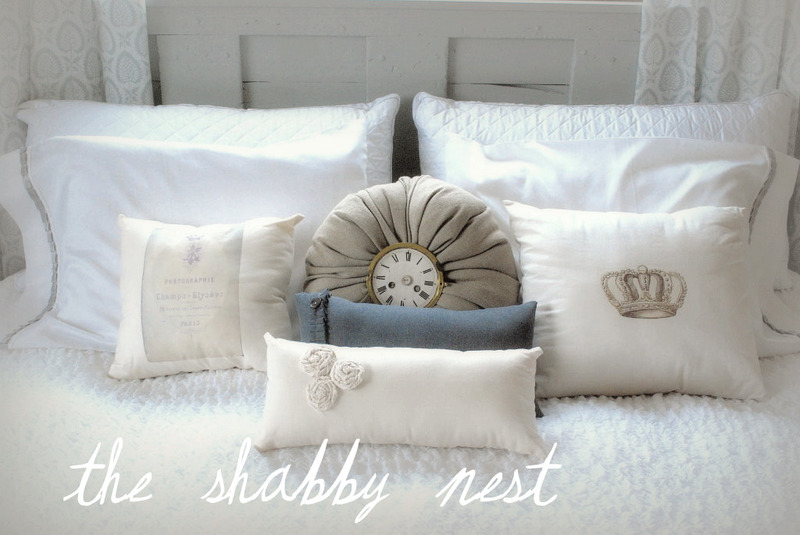 Link back to the Shabby Nest so that other's can enjoy the frugal goodness as well! The pillow cases are absolutely stunning. Amazing what a little ribbon can do. They look straight out of a catalog. Thanks for the inspiration - gorgeous! Thanks for hosting! The ribbon adds so much. It's beautiful and easy. I'll have to give it a try. Thanks for hosting a fun party again. Love this simple but very chic look! Great!!! Love that pewter colored ribbon! Thanks for hosting! What a very sweet pleat! ps Thank you again for hosting! Have a beautiful weekend. Love the pillowcases!!! And really, no pins? Oh, it's simply elegant! Thanks for the great idea. Thanks for hosting the party, I am so happy to have an extremely frugal project to link up. What a great and inexpensive touch to add to plain pillowcases! They look so much more special now! That's so simple and beautiful! Love it! Thanks for hosting this link party! Love the pillowcase tip. It's so nice when something little makes a BIG difference. LOVELY!!! Those pillows are beautiful!!! Just gorgeous! Off to look at the links for today! ps--I'm having a Garden Party linky tomm., love for you to join in! Your room turned out beautiful (shhh, it had my vote at SYTYCD). Hi..You are a person after my own heart..When you cannot find what you want you make it yourself..Beautiful..great job! & find some ideas that might inspire you & your family/Home. I hope you will follow me too. so pretty! I LOVE that clock pillow! Lovely and simple...that's my kind of sewing. Where did you find the silver pillow with pleats and what looks to be a clock? I love it and would love to either make or buy one just like it! I actually won the pillow in a giveaway...I linked to the blog in my week 4 So You Think You Can Decorate post. I am always on the look out for more pillow ideas! Nice job!